All images courtesy of the WWE. Sorry, another rant about the Survivor Series as we draw closer to this year's event. Gotta say, I'm really disappointed in the card. We've seen all of these matches before. I understand they have to recycle some of the matches, but wow. There's nothing to set this card apart and give it that "Big 4" feel. But that ended a long time ago. I know we'll never go back to the way things were in the early years of the pay per view. A card with nothing but elimination tag team matches. But I think they could go back to that concept and it wouldn't hurt a thing. Watching Old School Raw the other night made me really think about wrestling and how things used to be. My friends and I discussed it briefly. Was Old School Raw so enjoyable because the storylines and characters were better back then or because we were reliving something from our childhood that we enjoyed 25 years prior? It seemed like the characters back then were larger than life. Now, they just seem like everyday guys. And we're saturated with five hours of original programming each week (six if you count NXT) and a monthly pay per view. Sometimes two. So I've done some thinking, and here are some ways I think Vince McMahon and the creative team behind him could restore the reputation of the Survivor Series and make it one of the "Big 4" PPVs. Stop having elimination matches on Raw, Smackdown, and pay per views. The only time we should see an elimination tag team match is at the Survivor Series. That would require a major change to the September PPV, Bragging Rights. I've got ya covered. Keep the title, but make it a tournament style event. It could be an 8 man, single elimination tournament. Four guys from Smackdown and four guys from Raw. Make the final match a best two out of three falls. Your four guys on each show could qualify for the tournament in the weeks leading up to the PPV much like they qualify for the tag team match. Whoever doesn't qualify could wrestle in matches against non qualifiers from the other show. Then you tally up the total amount of wins for each side and present the trophy that way. While this idea is far from perfect, I think it goes back to my original point of keeping the Survivor Series a special event with its own identity. It also creates a special niche for Bragging Rights. It could also be a jumping point to Survivor Series to set up an elimination match involving the eight tournament participants. Just a thought. 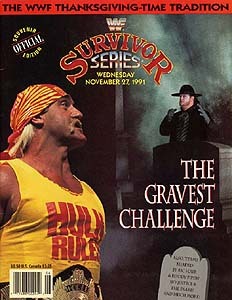 I liked the idea of having Hulk Hogan and Andre the Giant or the Honky Tonk Man and Randy Savage as captains of opposing teams at the Survivor Series. It looked like these matches were important enough to have the champ involved in them too. It lent credibility to the concept. In this day and age, we see the champ defend the belt or at least wrestle on a nearly weekly basis, plus each month on pay per view. Having them as a part of a team, leading a group into battle would give today's generation of fans something different. Ideally, the WWE champion would captain a team against another group from Raw. And the World champion would lead his team into battle with another group from Smackdown. Same goes for the Intercontinental and U.S. champions. I'm still not sure how to handle the tag team champions, since the tag team division is dismal at best right now. It would be hard to have a 20 man (10 tag team) elimination style match now days. Team Mystero and Team Del Rio are not very catchy. Not very original either. While "the Dream Team" and the "Rude Brood" were kind of hokie, they made the event a little more fun. I'd also try to fit the personality of the members together. That might not always work though. 1. Randy Orton's team vs. Wade Barrett's team. 2. Kane's team vs. Edge's team. 3. Daniel Bryan's team vs. Ted DiBiase's team. 4. Dolph Ziggler's team vs. Kaval's team. 5. LayCool's team vs. Natalya's team. These ideas could of course be tweeked, but I think it's a pretty good way to restore the Survivor Series and make it a pay per view I'd actually be interested in ordering again.